Hope everyone who celebrated had a lovely and safe 4th of July. Mr Sweetie and I had a total chill and delicious holiday. It was eating all day (of course! ), enjoying a bottle of Chardonnay (from Winc Wine Club), napping and watching "The Golden Compass". It was followed by more napping, eating and lighting fireworks when it got dark. This was pretty much how our 4th of July was in a nutshell. 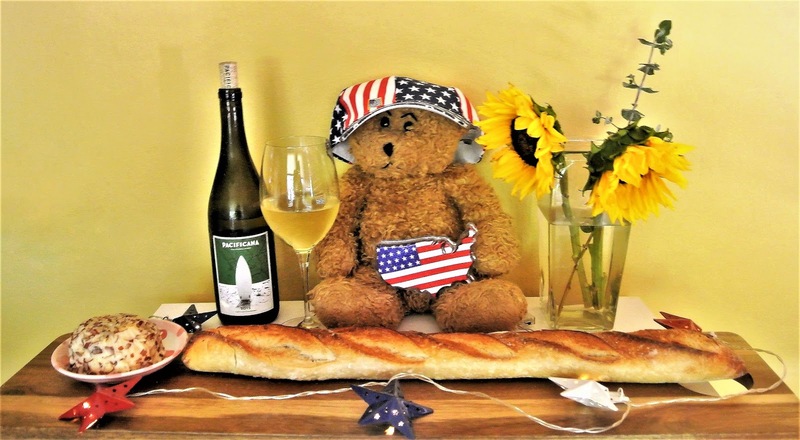 While waiting for the pork ribs to cook, I made a cheese board of toasted baguette and asiago ball, and opened a bottle of Chardonnay. The wine was delicious! We snacked on these while watching Twilight Zone marathon. Mr Sweetie woke me up so we could light the fireworks. I did not even know that he bought a firework set. They were really just Safe and Sound fireworks. Another neighbor also lit fireworks on our street as well. People came out to watch. Mr Sweetie was in charge while I sat on the porch and was happy with the kiddie sparklers. It turned out to be a lovely day. America is very far from perfect. I would like to keep this as a positive post because we are all aware of the hatred and sadness that currently threaten the liberty of many people who call America home. I choose in my own way to promote what this country is founded on which is the belief that everyone of us is created equal. We are free and have every right to pursue happiness for ourselves and the people that we love. I choose to focus on kindness and goodness and fight bigotry and oppression. Despite everything, I am grateful for my freedom to express my thoughts and freedom to worship. It sounds like you had a nice 4th of July celebration! The ribs that you baked looks delicious!!! I wouldn't mind stealing a bone or two ;). Glad to hear them turning out perfect. I need to buy some ribs from Costco next time! I appreciate the positive vibes you've put in this post. Hope you'll have a great week. Thanks, Nancy. My hope is to continue to post positive vibes only to counteract the negative events that seem to be more prevalent nowadays. I can tell that you are a carnivore. :) The ribs at Costco are def worth trying. Have a great week ahead! Now I'm craving for ribs, Jas :( I have never tried making it because I feel like I'll be sorely disappointed? My favorite ribs are the ones where the meat falls off the bone!